Jigsaw Sudoku puzzles replace the rectangular bold-lined boxes in regular Sudoku with irregularly-shaped 'jigsaw' regions. 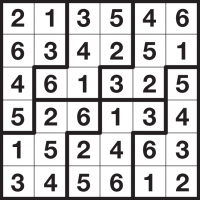 Jigsaw Sudoku is also sometimes known as Irregular Sudoku, Jigdoku, Logi-5 or Logi-6. In Jigsaw Sudoku the irregular jigsaw-regions that replace the 3-by-3 (or other size) box regions from Sudoku are always the same size. This means that in, for example, a 9x9 puzzle you must place 1-9 once each into every bold-lined jigsaw region, as well as the rows and columns. In all other respects the puzzle works in the same way, but this change in the region shapes introduces new twists into the logic required to solve the puzzle - and often makes it much harder for you to find the next move as a result! Look at the solved puzzle on the left. In this 6x6 puzzle notice how there are 6 bold-lined jigsaw regions, each containing 1 to 6 exactly once. Every Jigsaw Sudoku puzzle only ever has one possible solution, and it can always be reached via reasonable logical deduction. In other words, guessing is never required. Jigsaw Sudoku puzzles on puzzlemix appear at a wide range of sizes and difficulties. Usually they are 6x6, 8x8 or 9x9, although sometimes they are 12x12. In each respective case you must place 1-6, 1-8, 1-9 or 1-12 once each into every row, column and bold-lined jigsaw shape. Are you searching for help with Jigsaw Sudoku puzzles? Stuck on solving Irregular Sudoku? Don't know the instructions for Jigsaw Sudoku? Need Irregular Sudoku instructions? Want solving hints and tips for Jigsaw Sudoku? Then puzzlemix is the place for you to play Irregular Sudoku puzzles online. Looking for printed Jigsaw Sudoku puzzles? Visit Sudoku Xtra for puzzle magazines and books. Or are you looking for a Jigsaw Sudoku puzzle supplier? If so then check out Any Puzzle Media, my puzzle production company.